Imagine you are being pursued by a terrifying creature, but you don’t know what it is. You turn around for a second, lose some running time and momentum and you see the horrible creature that wants to kill you and eat you. That want and desire to know what is after you, do you really need to know? Movies are filled with such creatures, ranging from The Alien and Predator, to Dragons and The Host. But when you watch said films, there is a level of reassurance in them in which you know they don’t exist. But what if the creature is real? What if a film could make you scarred of something that is real and make you think twice before engaging in an activity in which, while rare of course, means there is still a chance of meeting the creature. Well, there is one film that has done just that for nearly 40 years now. Released by Universal Pictures in 1975, Directed by Steven Spielberg and based on the Peter Benchley novel of the same name; Jaws is highly perceived as one of the best films in the world, helping to launch the career of Steven Spielberg in the process and to this day being one of very few films on Rotten Tomatoes with a 100% fresh approval rating as well as becoming a major moment in the history of cinema upon its release. All of that for a film about a Great White Shark. The film begins on Amity Island with a young girl called Chrissie (Susan Backlinie) who goes skinny dipping before being pulled under water. The following morning, Police Chief Martin Brody (Roy Scheider) who lives on the Island with his wife Ellen (Lorraine Gary) and two sons Sean (Jay Mello) and Michael (Chris Rebello) goes in search of Chrissie meeting up with Chrissie’s supposed boyfriend Cassidy (Jonathan Filley) and Amity Police Deputy, Jeff Hendricks (Jeffrey Kramer) who has found the remains of Chrissie’s body washed up on the shore. Chief Brody waits to hear from the coroner who tells him that Chrissie died from a Shark Attack. Brody spurs into action wanting to close the beaches, but the island’s mayor Larry Vaughn (Murray Hamilton) however persuades Brody to keep quiet, so that he can keep the beaches open during the summer period. Brody decides to let it slip and go with the coroner’s new statement suggesting that the incident was a boating accident. While relaxing with his family on the beach, Brody spots something odd happening in the water and calls everyone to get out of the water, however, a boy named Alex (Jeffrey Voorhees) has disappeared, and the mother of the boy, Mrs. Kintner (Lee Fierro) puts up a $3,000 reward for whoever can kill the shark that killed her son. At a meeting to discuss this, Brody states he is closing the beach, but the mayor says only for 24 hours. Everyone is then drawn to the appearance of local Shark Hunter Quint (Robert Shaw) who says he will kill the shark, but demands $10,000 in return. The next day, fishermen head out to the ocean to hunt the shark. Meanwhile, marine biologist Matt Hooper (Richard Dreyfuss) arrives on the island and looks at Chrissie’s body and states that she was in fact killed by a shark. The fishermen then catch the supposed shark but Hooper states that it is a Tiger Shark, and not the shark they are looking for. That night, Hooper goes to have dinner with Martin and Ellen, saying he would like to look inside the caught shark’s stomach, but the mayor wouldn’t allow it. Brody and Hooper do it in secret and find no trace of Chrissie. They go out to sea and find a boat belonging to local fisherman Ben Gardner (Craig Kingsbury). Hooper goes underwater to look at the wreckage and finds a sizeable tooth but drops it after he sees the fisherman’s corpse. Brody and Hooper try to persuade the Mayor to close the beaches but he doesn’t listen and decides to keep the beaches open for the fourth of July. Tourists arrive in their hundreds to enjoy the sea-side resort while Brody and Hooper do what they can to keep the beaches safe. The mayor persuades people to go into the water and everything goes ok until a prank caused by a couple of kid’s forces everyone to run out of the water. The pranksters get found out, but a shark fin is spotted going into a pond/estuary where Brody’s son Michael is on his new yacht. A man in a rowing boat (Ted Grossman) is killed and Michael goes into shock. Brody has the mayor sign a contract to give Quint whatever he wants in return for killing the shark. Quint immediately falls out with Hooper but reluctantly agrees to take both him and Brody on the voyage. The next day, all three men head out to sea and Quint has Hooper drive the boat and Brody putting chum out to attract the shark. Quint has something hooked onto his fishing rod and tries to pull it in, but the identity of whatever it is remains unknown and eventually let’s go. Brody puts more chum out but sees the shark and is shocked by the size of it by saying the famous line “You’re gonna need a bigger boat”. The three men manage to tag a barrel onto it but the shark manages to get away before they can attach another. They stay the night and talk to each other showing each other their scars before Quint reveals that he was on the USS Indianapolis, the ship that delivered the Hiroshima Bomb before being sunk by a Japanese Torpedo and where a large number of the sailors were killed by sharks. The boat is then attacked by the shark. The following morning, the three men attempt to repair the boat but the shark returns. Brody tries to call the coast guard but Quint destroys the radio. They get another barrel attached to the shark and then attach both barrels to the boat, but the shark pulls the boat flooding the deck and engine. Quint, now consumed with killing the creature burns out the boat’s motor while trying to suffocate the creature in the shallow waters. With the boat now sinking, Hooper suggests a radical new plan to go down in a shark cage and poison the shark. The plan fails though when the shark attacks the cage, with Hooper narrowly escaping. Back on the boat, the shark attacks the two remaining men eating Quint in the process. With just Chief Brody left, Brody attacks the creature throwing a scuba tank in its mouth. From Hooper telling him the previous day that the tanks would explode, Brody climbs the mast of the almost completely sunk boat and shoots several rounds at the creature before finally hitting the scuba tank, causing the shark to blow up. Hooper returns to the surface and the two men swim back to shore. Jaws is an incredible film, a point you begin to realise the more times you watch it, the more you begin to understand it, and even more so when you discover that Jaws was supposed to look a lot different, and if had originally come to fruition may not be as good or as highly regarded as it has become. Jaws cast are terrifically portrayed from Minor to Major. Characters that only appear briefly such as Brody’s children, Mrs. Kitner, Meadows the reporter and the town’s upper-class woman Mrs. Taft (Fritzi Jane Courtney) have their own major points. Meadows (Carl Gottlieb) has a great yet brief on-screen presence, while Brody’s children add an extra level of depth to the Brody family giving them more of an emotional attachment to the screens setting as well as a connection for the audience also. Mrs. Taft is a great character as in she is an incredibly stiff upper lip toff type who is an absolute rotter to be around and acts in such a manner that makes herself feel superior to be around others but doesn’t achieve any sympathy from anyone and everyone else, particularly the audience. She is in the same league as the mayor and his cronies and believes more in stature and glory than in safety or the lives of other people wanting the beaches open instead of closed and possibly safer as a result. Scenes with her also include not laughing at jokes made by others and even protesting that she doesn’t find them funny, you know, the kind of person who believes that standards are more important than anything else. From here we go into the more major members of the cast. The character of Chrissie is only seen very briefly, but she is the all-important first victim. When she is grabbed from under water and pulled under you do see a level of terror in her eyes and the way she is portrayed, even more so to the point when she also has the look of someone who has no idea what is attacking her and it is more the fear of the unknown and death on the whole than what exactly is about to happen to her, a realization that becomes more clear as the scene carries on and as she screams for help. Ellen Brody holds the point of sanity for her family trying to keep Brody on the relaxed side of what is going on and not get too involved or in-depth with his new enemy. She is generally more patient and holds a great scene presence when she is on, appearing to be more calm than emotional, but that doesn’t stop her getting emotional when Michael is in danger or when Brody is going out to sea. Next to that you have the character of Hendricks; the deputy of Amity Island. He doesn’t appear to have much in this film other than to be the bumbling buffoon secondary policeman who doesn’t do much in the way of standing up for himself and mostly just takes orders than showing his own opinion. He is also however the only real political support that Brody has and is seemingly the only one in a political stance who believes Brody’s judgement on the situation is correct and trust that he knows what he is doing. He is also not devoid of much life as he takes his position seriously and when he finds Chrissie’s body, a real sense of emotion comes to light as the remains are not pleasant and he shows that he is in fact human and not at all a fool, but just seen as one. 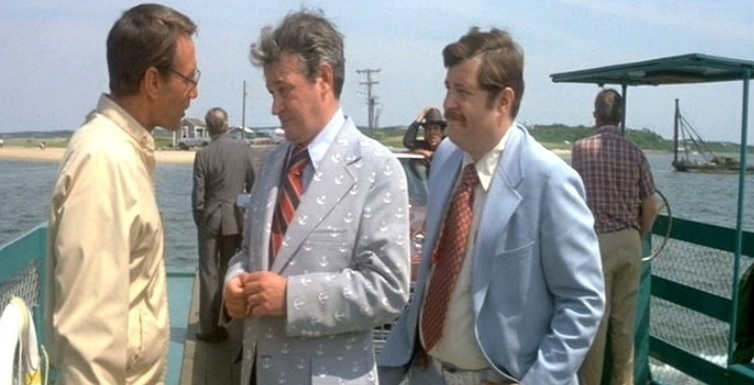 Then we move onto the Mayor of amity Island, Larry Vaughn. He is a man who is much in the same league with the higher end civilians of the own who believe in the accumulation of money being the biggest priority. A fair judgement for a small island as the island very much requires a lot of tourism in order to survive, however, when it comes to the appearance of a killer shark, Mr. Mayor and his higher-ups still want to keep the beaches open and at first think nothing more than this just being a passing incident, but when it continues, he still thinks solely about the money. He is in many respects a secondary villain after the shark as he is very single-minded in the pursuit of what he thinks is best, although it really isn’t and provides the film a good opposite comparison and something for Brody to put his frustration on as Brody has safety in front and the mayor doesn’t. He is also a very dodgy character in the way that he will use whatever persuasion skill he has to get what he wants, even having the coroner change his professional opinion as to what happened to the first victim. He is overall played very well as he is the type of character, along with Mrs. Taft that you have not the slightest bit of sympathy for and it is only from pure experience in the end that he learns the error of his ways, but still tries to shift the blame off himself in return. Despite all these great qualities though, the films three main cast members are the highlights. Roy Scheider’s character is that of the concerned outsider. It’s obvious that he knows what he is doing when he hears about the shark, closing the beaches and everything and while he may not be an expert or fully aware on the subject of sharks he does know the best course of action. However he does get a bit too committed and paranoid over the whole thing. There is also the problem that while his job is to uphold the law and protect others, there are those higher above him who have the authority to tell him what to do and will make him do, even if it’s the wrong course of action. The result then is that he is unable to do his job properly due to the shady characters who tell him what to do and as such becomes frustrated with the whole affair, especially when the body count continues to grow and knowing that if politics didn’t get in the way, he could prevent deaths. The use of a policeman character is also well done and makes the film not just an action film, but something of a crime drama at the same time with the policeman being the detective, closing in on his suspect and the shark the murderer but in a similar twist, it shows that the goody-goody policeman has to become as focussed as the killer and tap into his natural primal instincts in order to finally achieve the end result. He therefore gets overly committed to this result and by the end; he is a much more different person than the first time the audience sees him. Richard Dreyfuss on the other hand starts off as something more of a decent guy. He is brought in as a marine biologist and at first you grow to like him as he knows what he is talking about but is not just some professor or lecturer. Monster Movies have always required a level of science for the audience and usually achieve this through a character who might know what he is talking about. Hooper on the other hand does not look like a lecturer or acts like a mad scientist, instead he dresses more casually and connects to the audience as a likeable guy as such as he becomes more approachable. However this nice guy attitude eventually begins to dissipate, mostly at the point he meets Quint who also doesn’t take a liking to him either. At this point Hooper takes much a defensive stance and as he continues he begins to grow more distant from everyone else, in particular Brody who originally both start off as friends but who are now at constant loggerheads with each other. It’s only at the very end when the shark has finally been killed that they return to normal. As the final act progresses though you begin to see more of a normal person in Hooper though as he jokes and has a few laughs when he and Quint observe each other’s scars, just showing that while he may be the expert guy, he is also a human being inside too and while he may go astray for a while during the final act, he grows more in person as a result too. When I first watched Jaws when I was about 6/7 years old, I always had Robert Shaw’s character (Quint) down as a bad guy, because well, he wasn’t really pleasant and so when he dies I always assumed it was a good thing. In more recent years though, particularly more so in the last year, I have grown to like Quint a great deal and observe him no more as a villain, but as the film’s best character. From the first time you see him he is unpleasant, scraping the chalk board making everyone’s ears hurt, demanding everyone to listen to him, talking about what he does and demanding more money to achieve it. When he appears again much later in the film nothing has changed, he still appears to be somewhat dodgy and angry and points out things about other people, mainly Hooper, has fun about things people do and takes the position of a lazy fisherman on the boat but when the shark arrives becomes something of a Captain Ahab type character getting transfixed on his shark and bounty up until the moment he gets killed. Sounds unpleasant and almost like he say what was coming to him. But when you look between the lines and real study who he is, he becomes much more likeable as a person. When he demands more money, he is not just some greedy Bounty Hunter; he is an experienced Shark Hunter who knows what he’s doing. When he falls out with Hooper, he is not being horrible, he just despises those he thinks are getting a better way of living for doing much less, when he is fishing and having others do his work for him, he is keeping close vigil on the water and knows how best to hunt the animal and requires the other two to do what he asks fully to achieve this. It’s only towards the end when he gets too committed that things begin to go bad for him. He is a hardworking man and believes he is getting the most out of his job in order to do well at it. On top of that though, he is a man of experience, and not all of it good. Why is he a shark killer, because he knows what sharks can do from first-hand experience and when he tells his tale of life on the USS Indianapolis in what is a terrific monologue, you begin to get the real insight on him? You begin to fall in line with him, and try to question his position wondering if he does his job to live, or is looking for revenge; like Captain Ahab and his whale. From then on, and every time you watch the film from then, you really begin to understand him as a character and know not to judge a book by its cover, because while on the outside he is a committed man who appears to be very unpleasant, inside he is a normal human being and you become like a friend to him and understand the way he acts, because he doesn’t want to appear weak, but also you understand what he has gone through. The characterization of the shark is terrific achievement too. When the film was initially produced, the plan was to use the shark animatronic from early on and to see the shark from early on, but the shark did not work all too well and so Spielberg adopted an approach inspired by Alfred Hitchcock in which to suggest the existence of something underwater but not to show it, and more have a look that suggests that you are looking through its own eyes. This works as it makes the shark not just an animal but more like an actual killer, as you are seeing it pick its targets. It’s only until very much later on that this technique is held off together as the audience member is with Brody, Hooper and Quint out to kill the creature, and so you no longer are looking at the creature’s perspective but the perspective of those out to kill it. To begin with though, the shark is more positioned as the animal and also the mysterious killer. When you get to the final act out at sea, you begin to see the shark take on new traits, that of taking things personal with the crew by attacking and damaging the boat to fully chasing them and picking them off one by one. This trait of revenge makes the final few moments really hectic as each character goes to extreme lengths to survive and for the shark to increasingly damage the boat to get at them or get them in the water therefore fully transforming the creature from killer shark to monster. Another way that the shark is shown is through great effects in using a combination of Real Life footage with animatronic. The real life footage of the creature from a distance helps the thing to look real as it indeed is a real shark on the footage. The animatronic is more used for shots of real sharks that they had to fake because a real shark wouldn’t be able to really act for them, it would more likely just swim away, or eat the film crew. 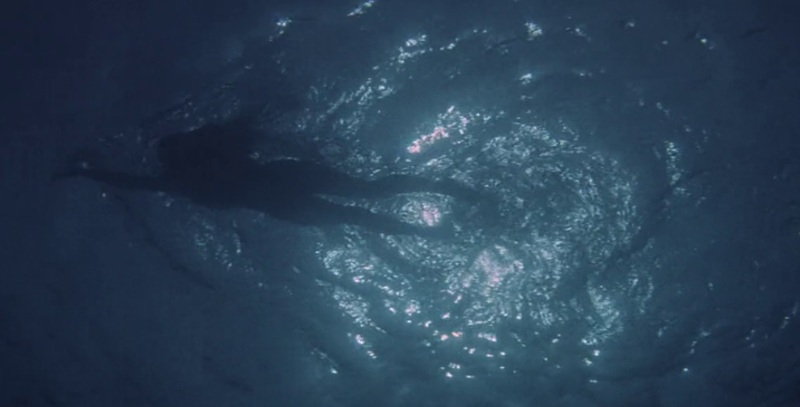 Such realistic shots are mostly used for underwater shots with the cage, such as seen far away, swimming away and tangling with the cage after Hooper gets out. The animatronic fills in the rest. The actual shark animatronic, it’s actually pretty good. While the effect looks very much outdated and almost cardboard/wooden like, it still holds an element of realism in it as the thing worked pretty perfectly in close up shots towards the end and while now may look more silly, thanks to the film building up the appearance of the creature, you are now fully in the scene and the possible silliness of the creature today is almost completely removed when the creature starts eating people close up. When the animatronic is used in the water too, from the perspective of above the water, the effect is brilliant as while it may not carry a lot of close-up detail it does enough to show the size of the creature as well as what it would look like at that angle. The film’s soundtrack produced by John Williams also aids in the shark’s portrayal. The film for the most part uses a soundtrack which covers different topics from tense mystery moments, to everyday life in amity, happiness, sadness as well as moments of wonder. The film generally uses pieces over and over again but they are pieces that work. The moments on the land with no Shark use great themes and soundtrack for moments of joy and happiness as well as general life and that is used to great effect to portray those moments. However it is the moments with the shark that produce an interesting contrast. When the shark is being hunted a piece of music plays which sounds more adventurous, like something used in a sailing, pirate film which sound like a celebration theme as the three men attempt to kill the shark. On the other hand to that though, you have the film’s main theme, that of the shark’s theme. The shark’s theme is iconic to this very day but its actual quite simple. It suggests the presence of something mysterious, but is not overly joyful. It sounds bad, it sounds dark, as there is a real danger approaching. The theme then builds into a tense action paced sound as the danger arrives and is now in view of sorts and you know you can’t get away, it is the approaching predator. As the theme is used into the later parts of the film, the same piece is transferred into another piece and becomes more of a piece of last stand music as Brody fights the shark alone and the tense sounding music begins to grow more desperate before finishing on a final high note which allows the film to use one more note of silence as to question what the final outcome is. Jaws is as amazing as it is regarded to be. The film is brilliantly shot with combinations of island life, to the perils of sea until its final conclusion out to sea with a sense of moral danger and adventure. While the film’s look and effects (not to mention Quint’s cool looking boat the Orca) may be outdated, they are still able to hold a great element of terror too as they are used to great effect. The film’s soundtrack is terrific and the portrayal of all the film’s major cast including the shark, are enjoyable from start to finish and at no point get boring. For nearly 40 years now this film has entertained and (but probably mostly) terrified audiences the world over, and still will do for decades to come. If you have not seen this film yet, you should. It is one of the true classics of cinema and still holds true to this day. While some monster films may use creatures that are entirely fictional, there is nothing more terrifying than using a subject and creature that is real, and continues to remain a real life danger as long as they continue to survive. Jaws is so well done to this point that you will be scarred of going back in the water for some time, unless it’s a swimming pool, well, because a Great White Shark can’t get into a swimming pool………………………..can it? GENEPOOL (Has anyone else noticed that the film’s three main cast members all have names which begin with the letter R)?